Air101: Rescue plan for Kenya Airways approved. 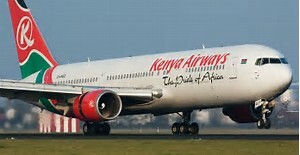 Rescue plan for Kenya Airways approved. Kenya Airways has apparently gained approval from its minority shareholders to issue more shares and convert some debt into equity, its reported today, Monday. This is despite some notable opposition from its local investors and lenders. According to the plans, Kenya Airways wants 11 local banks to convert their debt into shares in the company through a special scheme which would then be the second largest shareholder once the restructuring is concluded. For that to happen the debt-ridden airline will need to increase the number of shares to around 7 billion. However, some local banks had filed a court case objecting to the plan to turn their debt into equity, which may cause more than a few headaches for the Kenya Airways board as to struggle to find a way out of their financial quagmire. "We have been asked not to comment about it (court case), for good reason, but we are optimistic we will have the right approvals to finalise," Mbuvi Ngunze former CEO and now board advise of the airline said today. The Kenyan government owns 29.8 percent of Kenya Airways while KLM / Air France have a 26.73 percent stake and both approve of the plans.